Volcanic outcrops in the Galápagos Archipelago do not appear to provide the wealth of specimens found in other fossil-rich localities around the world. However, fossils are indeed present in the Galápagos Islands. This brief review addresses the where, what, when, and why of fossils in the Galápagos Islands and closes with a discussion of their potential contribution to the development of models on origins. Where are fossils found in the Galápagos Islands? 1) Sediments that were deposited in shallow waters around the islands and were subsequently uplifted above sea level often contain fossils of marine organisms (such as mollusk shells) . 2) Lava tubes. Lava tubes form during volcanic eruptions, when the top of a lava flow cools and solidifies but hot melt continues to flow underneath. When lava drains from these tube-like conduits, an empty space is left underground. These tunnels and fissures often contain sediment with fossil remains of terrestrial vertebrates . 3) The interior of some of the islands is characterized by a more consistently humid climate. Here, small lakes and bogs, formed within inactive volcanic craters, can be found. The sediments filling the bottom of these small depressions contain fossil plant material [3, 4]. What kind of fossils are found in the Galápagos Islands?---The fossils found in the emerged shallow marine deposits are dominated by marine invertebrates such as bivalves, gastropods, bryozoans, corals, and barnacles [1, 5-7]. Not visible with the naked eye but very abundant in the sediments are also microfossils of other planktonic and bottom dwelling, small (< 2 mm), shelly animals, such as foraminifers and ostracods . Rare, but sometimes found in these sediments, are skeletal fragments of marine and terrestrial vertebrates such as birds, lizards, and sea lions [1, 5, 7] (Fig. 1). Fig. 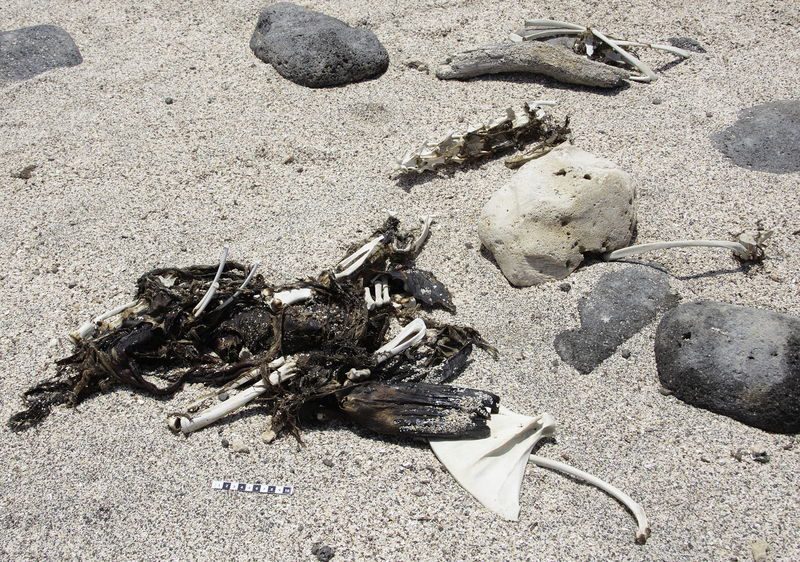 1: The carcass of a sea lion llies partly decomposed on a beach, Seymour North Island, Galápagos. Scale in cm. Skeletal elements from carcasses can be incorporated in beach deposits and eventually become fossilized. Fossils collected from the lava tubes include tens of thousands of bones and bone fragments of birds, reptiles, and mammals, as well as shells of land snails [2, 8, 9]. The vertebrate remains include specimens of the most iconic Galápagos species, such as the giant tortoise, land iguana, finches, and mockingbirds, together with species of rodents, snakes, lizards, geckos, bats, and birds. Interestingly, most of these bones represent remains of preys regurgitated by Galápagos Barn Owls, a species that roost and nest on ledges in the lava tubes. Bones from larger organisms (such as giant tortoises), on the other hand, represent animals that fell and died trapped in the tubes (Fig. 2). Fossil plant material recovered from bog and lake sediments mostly consists of microscopic pollen and spores [3, 4]. However, small-size macroscopic remains (such as seeds and plant fragments) have also been found . Fig. 2: A) Openings connecting to underground lava tubes, Isabela Island, Galápagos. Opening foreground has a diameter of ~50 cm. B): Carcass of a cat found inside the lava tube connected to the opening illustrated in A). 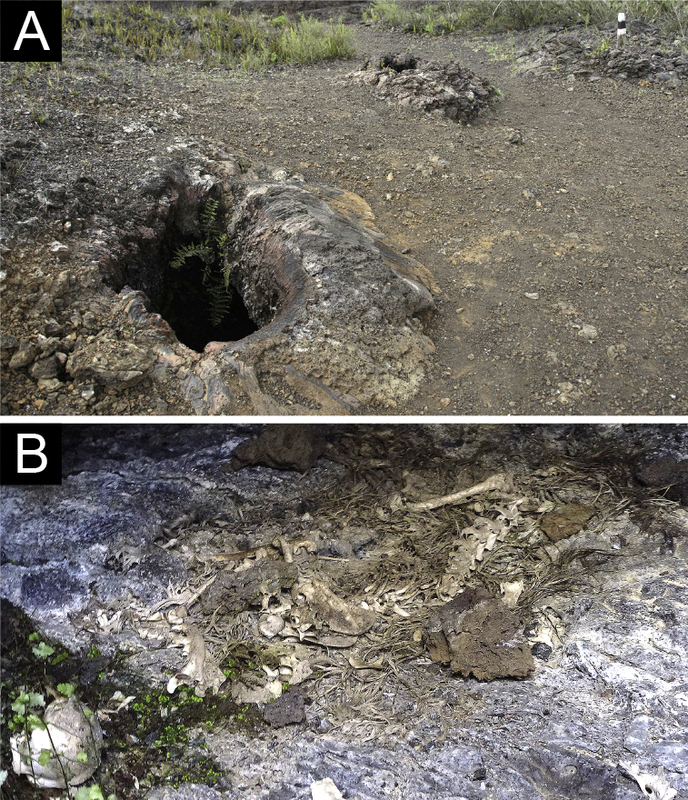 Trapping and death in lava tubes in one of the processes that result in fossilization of terrestrial vertebrates in the Galápagos Islands. When did the fossils of the Galápagos Islands form?---The question of age is a sensitive issue for creationists. There are two approaches to dating a geological object, such as a fossil or a rock. The first, called absolute dating, aims at assigning a numerical age to the object. The second, called relative dating, tries to establish if the object is younger or older than other objects but without assigning a specific numerical age. Absolute ages in geology are based on radiometric dating methods. Radiometric ages have values that suggest a very long chronology for life on Earth, creating a potential conflict with the Scriptural record . For this reason, creationists tend to reject these absolute values, looking for alternative ways of explaining these results. In general, however, there is an acceptance that the relative order of the dates (younger vs older) can be a reliable indicator of relative age, irrespective of the absolute values. In the Galápagos Islands, radiocarbon ages obtained from some of the fossil bones are almost invariably younger than 8 ka , with just a couple of exceptions giving values of around 20 ka [2, 8]. Radiocarbon ages of organic matter associated with the fossil plant material are also consistently younger than 26 ka [4, 13], with the exception of one layer dated as older than 48 ka . Fossils in marine deposits are considered younger than 2 Ma , based on radiometric ages of volcanic rocks interbedded with the deposits . In the standard, long-age chronology these dates correlate with the very top intervals of the geologic column (Pleistocene and Holocene). In summary, a mixed approach of absolute and relative dating seems to suggest that Galápagos fossils formed during the most recent part of Earth history, being restricted to the top layers of the geologic column. Why are paleontologists interested in studying fossils of the Galápagos Islands?---Fossils of the Galápagos are explored as an archive of past life and ecology in the islands. Topics being pursued by paleontologists include: a) documenting patterns in species diversity and morphological trends, with potential insight on the origination of the endemic fauna and flora [2, 15]; b) studying the impact on the ecosystem of the introduction of non-native flora and fauna, with implications for ecology and conservation [2, 10]; and c) reconstructing past climatic trends and events in the island and in the tropical Pacific ocean system [3, 4]. Implications for creationist models---Although not as iconic and well known as their living counterparts, fossils of the Galápagos Islands can indeed offer some valuable contributions to the discussion of origins when approached from a creationist perspective. The following points summarize some of the most significant considerations. Correlation with Biblical Chronology: One of the key question asked from a creationist perspective would be if the Galápagos fossils formed before, during, or after the biblical flood. Two important elements inform a possible answer that probably most creationists would embrace. First, the fossils appear to be relatively young, being found in deposits that are often within recent features of the landscape (e.g., lava tubes, craters) and associated with Pleistocene and Holocene radiometric ages. Secondly, the fossil assemblages consist almost completely of modern species, and not of extinct types [8, 15]. Most creationists would agree that modern species differ from pre-flood species, as they adapted to new environmental conditions after the flood. Therefore, when considering these two aspects, a reasonable conclusion in a creationist model would be that these fossils formed during the post-flood era. Stasis and Rates of Evolution: From the time of Darwin, modern species in the Galápagos have been presented as a paradigmatic illustration of speciation and origin of new species from a common ancestral form. However, currently known fossils in the Galápagos do not significantly corroborate this narrative. The overwhelming majority of recovered fossils belong to known modern species, with very few examples of extinct forms [2, 6, 15, 16]. Therefore, rather than documenting gradual change, the Galápagos fossils illustrate stasis. It could be objected that transitional fossil series are not observed because the fossil record of the islands is fragmentary and represents only the most recent time interval. However, this is a suggestion based on data we do not have. What is observable does not capture evolutionary transitions. Order in the fossil record: Different types of fossils are not distributed randomly in the geologic column but follow a specific pattern of appearance and disappearance. Fossils of the Galápagos can be used as a model to explore why various types of fossils are not all mixed up in the strata but have a certain order. Two main factors seem to be at play: time and space. There are no fossils of dinosaurs or African lions in the Galápagos. We know that African lions are not extinct, but they live only in the African continent. Therefore, the reason why lions did not fossilize in the Galápagos is linked to their geographic distribution (space). On the other hand, dinosaurs are extinct. Therefore, it could be that they never fossilized in the Galápagos because they were not present on Earth at the time of formation of Galápagos fossils (time). The presence or absence of certain groups of organisms in time and space determined the ordered distribution of fossils, both in creationist and evolutionary interpretations of the fossil record. The Process of Fossilization: Fossils of the Galápagos can be used to show how the process of fossilization depends on both the characteristics of an organism and its depositional environment. For example, the marine creatures best represented in the Galápagos fossils are those with shells and hard parts. Soft-bodied animals, like sea cucumbers, have much lower probability of being fossilized. The environment of deposition is also crucial for fossilization. For example, volcanic lavas are not favorable for the preservation of dead organisms, but if traps where sediment can accumulate are present (e.g., the lava tubes) fossils can be found even in volcanic terrain. Furthermore, terrestrial environments (e.g., lakes and bogs) are more likely to preserve fossils of terrestrial organisms (e.g., land plants) and marine environments will tend to be dominated by fossils of marine organisms. Using the Galápagos Islands as a case study, one could conclude that fossilization is certainly not ubiquitous and does not preserve all types of organisms but even in unfavorable environments (e.g., volcanic provinces), fossilization is not as unlikely as one would think. Depicting the fossil record as highly fragmentary and incomplete might be a mischaracterization of a very rich archive of past life forms. Hickman, C.S. and J.H. Lipps, Geologic youth of Galápagos Islands confirmed by marine stratigraphy and paleontology. Science, 1985. 227(4694): p. 1578-1580. Steadman, D.W., et al., Chronology of Holocene vertebrate extinction in the Galápagos Islands. Quaternary Research, 1991. 36(1): p. 126-133. Colinvaux, P.A., Climate and the Galapagos Islands. Nature, 1972. 240(5375): p. 17-20. Collins, A.F., M.B. Bush, and J.P. Sachs, Microrefugia and species persistence in the Galápagos highlands: a 26,000-year paleoecological perspective. Frontiers in Genetics, 2013. 4: p. 269. Finger, K.L., et al. Pleistocene Marine Paleoenvironments on the Galapagos Islands. in GSA Abstracts with Programs. 2007. Ragaini, L., et al., Paleoecology and paleobiogeography of fossil mollusks from Isla Isabela (Galápagos, Ecuador). Journal of South American Earth Sciences, 2002. 15(3): p. 381-389. Johnson, M.E., P.M. Karabinos, and V. Mendia, Quaternary Intertidal Deposits Intercalated with Volcanic Rocks on Isla Sombrero Chino in the Galápagos Islands (Ecuador). Journal of Coastal Research, 2010: p. 762-768. Steadman, D.W., Holocene vertebrate fossils from Isla Floreana, Galápagos. Smithsonian Contirbutions to Zoology, 413: 104 pp. Chambers, S.M. and D.W. Steadman, Holocene terrestrial gastropod faunas from Isla Santa Cruz and Isla Floreana, Galapagos: evidence for late Holocene declines. Transactions of the San Diego Society of Natural History, 1986. 21(6): p. 89-110. Coffey, E.E.D., C.A. Froyd, and K.J. Willis, When is an invasive not an invasive? Macrofossil evidence of doubtful native plant species in the Galápagos Islands. Ecology, 2011. 92(4): p. 805-812.
van Leeuwen, J.F., et al., Fossil pollen as a guide to conservation in the Galápagos. Science, 2008. 322(5905): p. 1206-1206. James, M.J., A new look at evolution in the Galapagos: evidence from the late Cenozoic marine molluscan fauna. Biological Journal of the Linnean Society, 1984. 21(1‐2): p. 77-95. Steadman, D.W. and C.E. Ray, The Relationships of Megaoryzomys curioi, an Extinct Cricetine Rodent (Muroidea: Muridae) from the Galapagos Islands, Ecuador. Smithsonian Contributions to Paleobiology, 51: 24 pp.